FL-150 details everything you earn and spend. Great news – by the time you reach this form, you’ve completed the first phase of your divorce. As the petitioner, this included the petition (FL-100), the Summons (FL-110), the UCCJEA (FL-105, because you have kids), service has been completed on your spouse, and the Proof of Service of Summons (FL-115) is done. If you are not a petitioner and/or don’t have minor children, you will want to choose the correct path for your circumstances. Next, you’re going to move into phase two of the divorce. This involves work that no one enjoys, but it must be done. Form FL-150 is your Income and Expense Declaration where you detail everything you earn and spend, and it is completed by both petitioner and respondent. Download a copy of the form and let’s get started. You’re no stranger to the top of each form by this point, and we’re continuing on with our sample petitioner John Smith. Don’t forget to include your case number on the right side. Semi-monthly = Paid 2 times per month. 12 months x 2 = 24 paydays each year. Bi-weekly = Paid every other week, or every 2 weeks. 52 weeks/year = 26 paydays. This can equate to a big difference in your overall income if you’re paid 24 vs. 26 times per year. If you’re having issues determining this, please reach out to us and we’ll assist you. Assuming you’re employed, the first page really isn’t too difficult. You’ll need to know your employer’s name, address, phone number, job title, pay details, hours, and start date. If you are salaried, it’s best to input amount per month, and keep in mind the semi-monthly versus bi-weekly difference we covered above. Next, you’ll input your age and education. This is self-explanatory, and you’ll input your current age, education degrees, high school completion, and any vocational training. The tax section can be tricky, so see below for clarification. Tax year: If you last filed taxes in 2014, that means you filed for tax year 2013. In our sample petitioner John’s situation, he filed his taxes in spring of 2016 for the 2015 tax year. Filing Status: Your tax filing status will be based upon your last filing, not your future status after the divorce. Most couples file as married, either joint or separate, so keep this in mind. Exemptions (d): Do not gather this info from your pay stub. The form is asking how many exemptions are claimed on the tax return itself. If you’re confused, it’s best to refer to your tax return, or you can speak to your tax preparer. If you still come up short, you can reach out to us and we’ll attempt to help. The key is to provide your best estimate of the other party’s income. If your spouse is unemployed, input $0. It’s not the time to let personal feelings come into play and attempt to harass your spouse. We’ve had cases where one party said, “Well my spouse could be making $50K/year and I calculated this because I’ve done all the research about the jobs in the area and they’re just too lazy to get a job.” The judge doesn’t care about that. The only thing the form is asking is what you think their income is, so you need to put a reasonable estimate. If you honestly don’t know, it’s perfectly fine to list, “Unknown.” If you’re unsure, but file joint tax returns, you can simply take a look at your return to see how much your spouse earned. At the bottom of the first page, you’ll see the fields for date, printed name and signature. Our recommendation is to complete the entire form first, and then fill out these fields last after you are sure all pages are completed and accurate. We mentioned pay stubs earlier, and the top of page 2 is the reason why. In bold, you’ll see the part that starts with, “Attach copies of your pay stubs…” The concept of semi-monthly and bi-weekly pay periods arises again. If you are semi-monthly or monthly, your last month’s income and your average monthly income should be identical unless you receive a raise. You’re always paid twice a month, so it shouldn’t change. If you’re on a bi-weekly pay period, there are between two and four pay periods throughout the year where you’ll have an extra pay period throughout the month. This will result in your average monthly figure and your last month’s amount differing slightly. If you have investment income, you’ll be required to attach some sort of schedule showing your receipts. We see a lot of cases where real property is rented out at a loss, so if you fall into that category you’ll need to attach a page to illustrate this. It doesn’t have to be extremely formal, such as a submission for a tax return, rather a page that shows loss on the property will suffice. If you are self-employed or own your business, you’re going to complete this section. Make note of the required attachments and instructions in bold text. With this section, the key will be to have your pay stubs available for reference. Refer to it as you progress through each letter in this section. Do you have union dues? Required retirement payments? There’s a difference between voluntary and mandatory (required) retirement contributions. If you’re a teacher and have CalPERS or CalSTRS, or you’re part of a union, it’s common to have mandatory retirement contributions. Majority, however, have voluntary contributions. In other words, “I choose to contribute to my retirement account,” versus “I’m forced to contribute each month.” Moving down to, “C,” note that medical insurance premiums are your monthly fee to obtain coverage, not your out of pocket copay that’s required when you have an actual medical visit. Progressing from “D” through “G,” complete any of these that apply to you. Under assets, “A” through “C” is a basic summary of financial assets associated with the value of your estate. Complete each to the best of your knowledge. Don’t be intimidated by this next section. The key is to be as factual and thorough as possible. Starting at the top, you’re going to list everybody that lives with you, along with their age, their relationship to you, how much money they earn each month. Finally, check the box that corresponds to whether or not they contribute to your household expenses. For most, it’s the kids that live them, and they don’t work. If they do work, the kids don’t usually contribute to the household expenses, so this is relatively easy to complete. This is the case with sample petitioner John as seen in the above example. This refers to your household budget. If you happen to track your monthly finances using an online program such as Mint, you’re already ahead of the curve. If you do not, you’re going to have to estimate what those costs are. So, for most this will consist of estimated expenses because you’re not going to go through your bank statements from last few months and calculate what your average grocery bill was to the exact penny. They’re looking for a rough approximation. On the other hand, items that you can obtain specific numbers on such as your mortgage or rent, which are typically a fixed number every month, will be easy. Health care costs refer to your costs associated with maintaining coverage each month, as opposed to what you pay out of pocket when you visit the doctor. Childcare costs refer to what you actually pay. If you and your spouse are splitting childcare costs which run $1,200 per month, you’d input $600 for your share. Remember, there’s no need to lose sleep over this section. Input realistic estimates to paint a picture of your household finances. If anything, completing this accurately is a good refresher for managing your new future budget after the divorce is over. Next, you’re covering installment payments. Anything you pay on a monthly basis, such as a second mortgage, auto loans, student loans, IRS tax debt, or anything else you’re paying on a regular monthly basis would go there. Great news – you get to skip this section because you don’t have an attorney, and you’re doing this on your own. If you did have an attorney, it’s something that they know how to complete and would do it for you. Since you have minor children of the relationship, you are going to complete this page. We’ll detail each step below. Our sample petitioner John has 2 in his marriage. Input the number you have, followed by the percentage of time they spend with you and your spouse. If you’re not sure of the percentage, you can describe the arrangement in the space provided. Does your employer offer insurance benefits that cover your children? Check the corresponding box. Keep in mind that this isn’t asking if your kids have insurance coverage, rather if the option exists through work, along with the specific info related to your employer’s insurance offering. This question is important because a lot of companies offer insurance to their employees, but don’t necessarily extend the option to cover the children of employees. This section is self explanatory and what we consider discretionary. In our experience, most judges don’t invest too much time here. If you have a special needs child you may consider filling this out. It doesn’t apply to most situations. 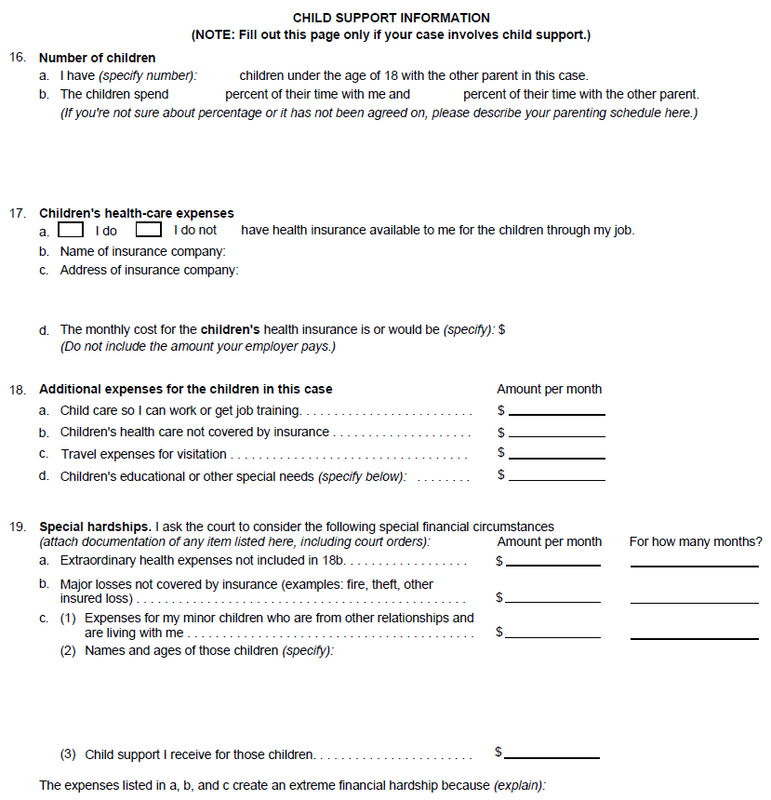 If you want to inform the judge with more information related to child support in your case, you can attach additional pages. You can input, “See attached,” and attach additional pages with the additional details. In closing, remember to attach your last 2 months worth of paycheck stubs to this form. If you’re receiving unemployment, you need to include your unemployment stubs from the last 2 months. The bottom line is any form of income or compensation you receive needs to be attached, and don’t forget to print your name, input the date, and sign the bottom of page 1.